Global music and entertainment platform TIDAL will exclusively livestream select performances from the Budweiser Made In America Festival. The JAY Z curated, two-day event in Philadelphia, PA will include performances from a stellar lineup including TIDAL Rising and TIDAL Discovery artists performing on the festival’s TIDAL Stage. The show will be livestreamed on TIDAL’s homepage at tidal.com. TIDAL livestream begins at 1:30 PM (EDT) on Saturday, September 5th and Sunday, September 6th. 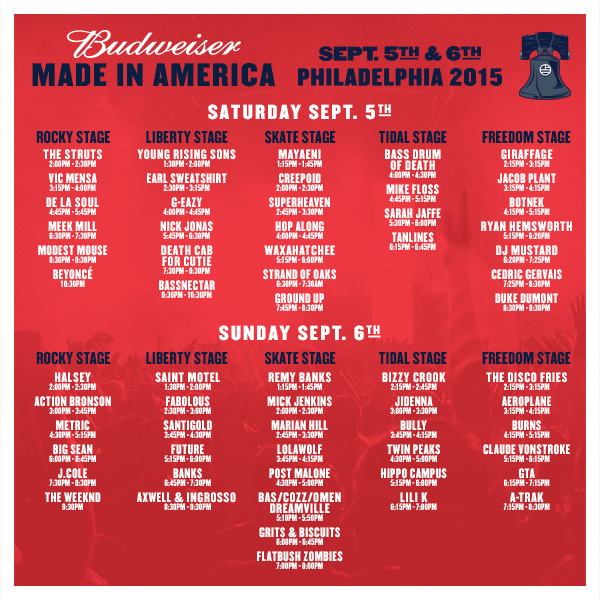 Slated for its fourth year in Philadelphia, the “Budweiser Made in America” Festival will once again attract thousands of visitors and festival-goers to the City of Brotherly Love on Labor Day weekend 2015. After the inaugural two-day music festival in 2012, Mayor Michael A. Nutter announced that the event generated at least $10 million in economic impact for the city’s economy. Additionally, the “Budweiser Made in America” Festival benefits local United Way organizations with the goal of having a positive impact on the host community. As a result of the 2012 festival, United Way of Greater Philadelphia and Southern New Jersey invested more than $350,000 into education and workforce development initiatives. The City of Philadelphia is well-positioned to host the festival once again in 2015: the city is strategically located on the east coast, boasts world-class transportation and amenities, and local officials have experience producing and accommodating big events like the annual Gore-Tex Philadelphia Marathon, the annual Wawa Welcome America Festival for the 4th of July, and the upcoming World Meeting of Families 2015. TIDAL is an innovative platform to experience and discover music from artists around the world, enjoy access to exclusive and curated content, and connect and share with artists. TIDAL is available in more than 45 countries with a 30 million song catalog, and more than 75,000 high quality videos. The service offers high-fidelity CD sound quality, high quality video, expertly curated content and unique experiences. TIDAL X gives fans the opportunity to connect with their favorite artists and witness unique experiences. From intimate performances, meet-and-greets, and even dinner with artists, the possibilities for TIDAL X users are endless. TIDAL X experiences showcase and support artists of all levels, giving them a platform to connect with their most loyal fans around the globe exclusively through TIDAL.